During his postgame press conference, Arizona Cardinals head coach Bruce Arians told reporters that quarterback Carson Palmer will miss the team’s next eight games. Palmer suffered a broken arm after being hit in his team’s Week 7 loss to the Los Angeles Rams and is set to undergo surgery. Prior to the Week 7 contest, Palmer had played all 433 offensive snaps for the Cardinals, and was ranked 16th among quarterbacks with a PFF overall grade of 76.8. However, Palmer had been plagued with poor offensive line play since Week 1. 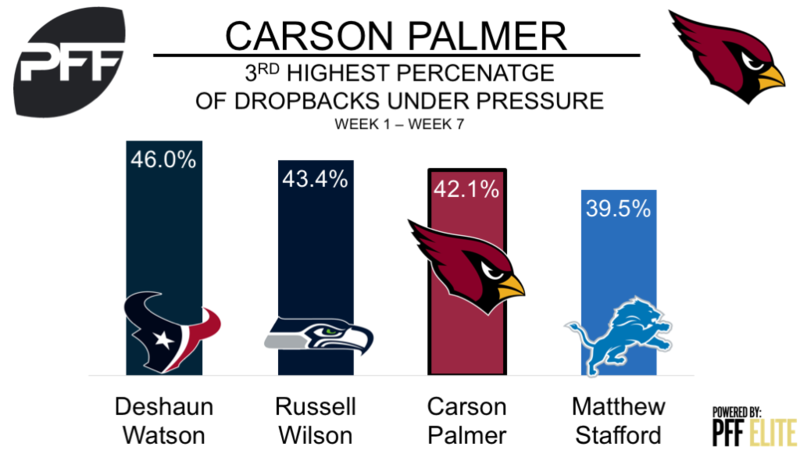 Through the first seven games, Palmer had 122 dropbacks and 93 pass attempts while under pressure, both the most among quarterbacks. Despite this, Palmer has been relatively productive, completing a league-high 46 of those pressured-attempts for 590 yards. Ever since the start of the season, it has been clear that the Cardinals offensive line has been an accident waiting to happen. As a whole, the unit has now allowed a league-high in sacks (17), quarterback hits (25) and quarterback hurries (82), for 124 total pressures, 30 pressures more than the next closest offensive line. Through seven games, they have allowed their quarterback to be either sacked or hit, once every 7.3 passing plays. With Palmer on the sidelines, 10th-year quarterback Drew Stanton will start in the team’s next game against the San Francisco 49ers. Stanton will have next week’s bye to prepare, which is the best-case scenario for the Cardinals, as Stanton was underwhelming in relief of Palmer this week, completing just 5-of-14 passes for just 62 yards and an interception.